The World’s Fair of 1964-65 was the third major international exhibition to be held in New York City. The Fair was held in Queens’ Flushing Meadows Corona Park, the same site as the 1939-40 World’s Fair. The theme of the Fair was “Peace Through Understanding”, and it was dedicated to “Man’s Achievement on a Shrinking Globe in an Expanding Universe”. This theme was symbolized by the Unisphere, a 12-storey stainless steel representation of the Earth. The Unisphere was featured in the 1997 movie Men in Black; fortunately (on many levels) for New Yorkers, the alien space ship that destroyed the Unisphere was but a special effect, and the structure remains standing, a proud symbol of the borough of Queens. This tall, slightly tapered glass is one of the many souvenirs sold to celebrate the Fair. It is one of a set of eight, each representing a pavilion of the Fair. Each glass is frosted, and decorated with two different colors of enamel. This particular glass is dedicated to the World’s Fair Circus. On the front of the glass, an old fashioned style circus ring is depicted in red and purple, with light beams directing attention to the spectacle. On the reverse of the glass, a purple panel is inscribed: “Visitors to the circus will thrill to outstanding acts from throughout the world. A major daily attraction will be an old fashioned circus parade around the fairgrounds with clowns and wild animals galore. Here is a remarkable show for children of all ages”. 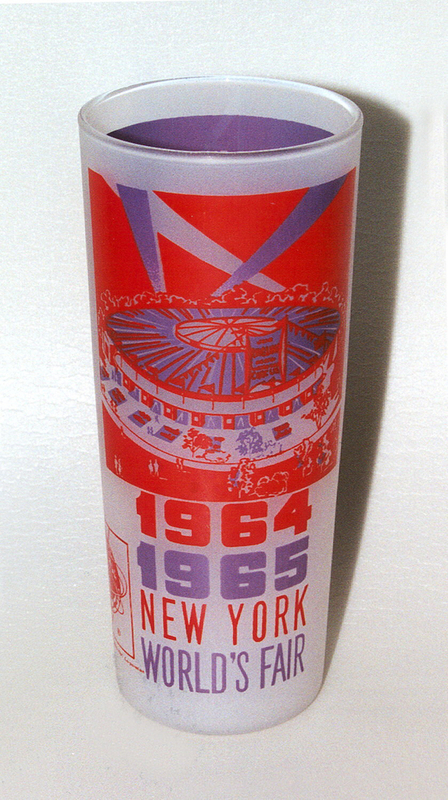 Unfortunately, despite 26 million visitors, neither the circus, nor the Unisphere, Pool of Industry, Hall of Science, Federal Pavilion, New York State Exhibit, Port Authority Building, or Shea Stadium (depicted on the other glasses in the set) would prove sufficient to make the Fair financially successful. Catherine Powell is a graduate student in the History of Design and Curatorial Studies program offered jointly by the Parsons School of Design and the Cooper Hewitt, Smithsonian Design Museum. She is a Fellow in the Product Design and Decorative Arts Department of the Museum. World's Fair Circus Glass, United States, ca. 1964; Molded and enameled glass; Gift of Max Pine, 1999-53-7.